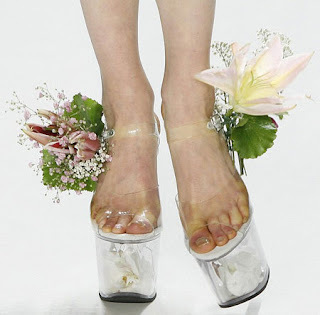 Platform shoes from Scherer Gonzalez's Spring 2009 Collection. Today marks the passing of The March Equinox. I want to say something clever and intellectual but science and geography were never my forte in school so why pretend to be knowledgeable now? However, what I do glean from this natural phenomenon is it marks the change in seasons. And to celebrate, I'm wearing this impossibly bright cerise coloured knit top which comes with a pretty grosgrain ribbon tie at the waist and my trusty black tailored slacks. I'd initially started the day with a gathered skirt but switched to trousers as it got real windy as the day progressed. No need to inflict the world with sightings of my knickers - I'm already blinding them with my top.